Ring in the Year of the Snake with fun arts and crafts, food, cultural activities, and performances on Sunday, Jan. 6, at the Japanese American National Museum, 100 N. Central Ave. in Little Tokyo. 12 to 5 p.m.: Snake Sculpture Candy. Watch world-renowned candy artist Shan Ichiyanagi make snake sculpture candy. For children only. Candy snakes will be raffled off at the start of every hour. 1 to 3 p.m.: Onigiri Design Contest. Learn how to make onigiri rice balls in a contest sponsored by Common Grains. 2:30 and 4 p.m.: Mochitsuki. Traditional rice cake pounding ceremony will be demonstrated by Kodama Taiko. 3:30 p.m.: Announcement of Onigiri contest winners. 11 a.m. to 5 p.m.: Jump around in the Snake Jumper and enjoy the Toddler Room. 11 a.m. to 5 p.m.: Special fukubukuro (lucky bag) sale at the Museum Store. 11:30 a.m. to 1 p.m.: Taste and purchase different varieties of rice. Sponsored by Common Grains and JRE (Japan Rice and Rice Product Export Promotion Association). 12 to 3 p.m.: Omikuji (sacred lottery) will let you know what kind of year to expect. 1 to 3 p.m.: Reptacular Animals presents a reptile petting zoo. Come meet real snakes and other cool reptiles. 1 to 4 p.m.: Party Faces will paint your face like your favorite zodiac animal. 1 to 5 p.m.: Begin the new year with lucky zaru soba (buckwheat noodles) from Kidding Around the Kitchen. 2 and 3:30 p.m. Learn how to play Japanese drums with Bombu Taiko. 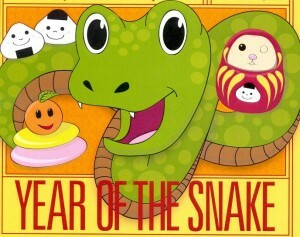 Celebrate the Year of the Snake by making some slithering snakes of your own. Make a decorative wreath including all the Asian zodiac animals. At Ruthie’s Origami Corner, fold your own origami snake. Free admission all day. For more information, call (213) 625-0414 or visit www.janm.org.